Republican Senate candidate and Southern Baptist Alabama Judge Roy Moore's pastor at Gallant First Baptist Church, where he has worshiped for most of his life, dismissed swirling allegations of sexual misconduct against his parishioner as "untrue" Sunday. 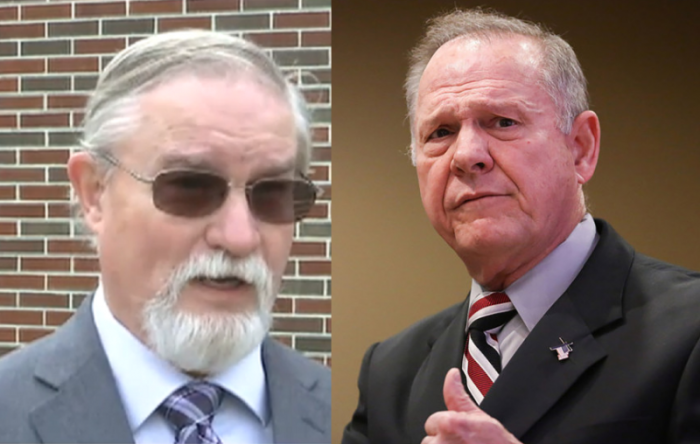 "I've known Roy Moore for 25 years," Gallant First Baptist Church, Pastor Tom Brown told AL.com after the 11 a.m. worship service on Sunday. "He's been a man of integrity, honor and character." Recent allegations in The Washington Post challenge that honorable image of Moore. One woman claims that decades ago, Moore now 70, initiated a sexual encounter with her when she was just 14. He was 32 at the time. Three other women alleged they had dates with Moore when they were teenagers as well. Brown said he spoke with Moore about the allegations and he has dismissed them as untrue and he believes him. "He's hurt about what's been said about him," Brown told Fox News. "He says it's untrue and I believe it's untrue because I've known him for 25 years." During a campaign speech in Huntsville, Alabama, Sunday night, Moore also publicly dismissed the allegations as "untrue" and threatened to sue The Washington Post. "The Washington Post published another attack on my character and reputation because they are desperate to stop my political campaign. These attacks said I was with a minor child and are false and untrue — and for which they will be sued," Moore said, according to CNN. "He comes as often as he can, when he's not traveling and speaking," Brown said. "He's been very busy. He loves being here with his church family." The pastor further told Fox News that Moore has a strong following within his community and the people are standing with him. "When he's here, we talk to him and tell him we're praying for him and supporting him," Brown said. One of Moore's church sisters, Daphney Gray said Moore has shown nothing but love to her and her family and it's one of the reasons she cannot entertain the allegations against Moore. "I have heard things, but I don't let other people's opinion sway my opinion," she said. "I just deal with the man that I see on Sundays and how he has treated my family since we've been here." Leigh Corfman alleged in The Washington Post report that she was 14 years old in early 1979 when she met Moore as she waited outside a courtroom in Etowah County, Alabama. Moore who was a 32-year-old assistant district attorney at the time offered to watch Corfman while her mother went inside for a child custody hearing, the report said. Moore asked Corfman for her number when they were alone and days later he arranged a meeting with her at his home in the woods. He allegedly told her how pretty she was and kissed her during that first rendezvous. During a second visit Corfman alleged that Moore took off her shirt and pants and removed his clothes. She said he touched her over her bra and underpants and guided her hand to touch him over his underwear. "I wanted it over with — I wanted out," she recalled thinking. "Please just get this over with. Whatever this is, just get it over." She asked him to take her home after that and he complied.